Develop clear, written medical waste policies and procedures – Maintaining an efficient point of use collection process means spelling out clear instructions for the clinical staff who will generate that waste. Of course, these details are typically covered with new hires during training, but it is also important that staff members have a written policy to refer to throughout their course of employment to make compliance easier. Educate staff via comprehensive compliance training – As the person who handles the medical waste disposal process day-to-day, you know why the policies and procedures for handling that process are so very important – but does your clinical staff? Compliance training is an important means of ensuring that they are able to look beyond the tedious details of those policies and procedures to see the bigger picture – the potential personal, professional, financial and legal risks of failing to follow them. People are generally much more likely to follow the rules carefully if they clearly understand them and the reasons why they are put into place. Review waste classifications with staff regularly – Healthcare settings are fast-paced and complex environments. Workers are responsible for remembering and complying with a plethora of policies, procedures and regulations every day as they perform their clinical duties. That means that it can be easy for details to fall through the cracks, like rules about which types of medical waste belong in what containers. For that reason, reviewing waste classifications with your staff regularly is important to ensure that waste is handled appropriately at the point of collection. Use proper containers and make sure they are clearly labeled – While hospitals and large clinics generally have standardized and color coded receptacles for medical waste in every patient care area, smaller healthcare operations may not. This can make managing disposal at the point of use more confusing for staff amid the hustle and bustle of their daily duties. Make sure that containers used by your staff every day are clearly marked for the specific category of waste they are meant to contain and, when necessary, contain the right, color-coded liners to make it easier to avoid mistakes. 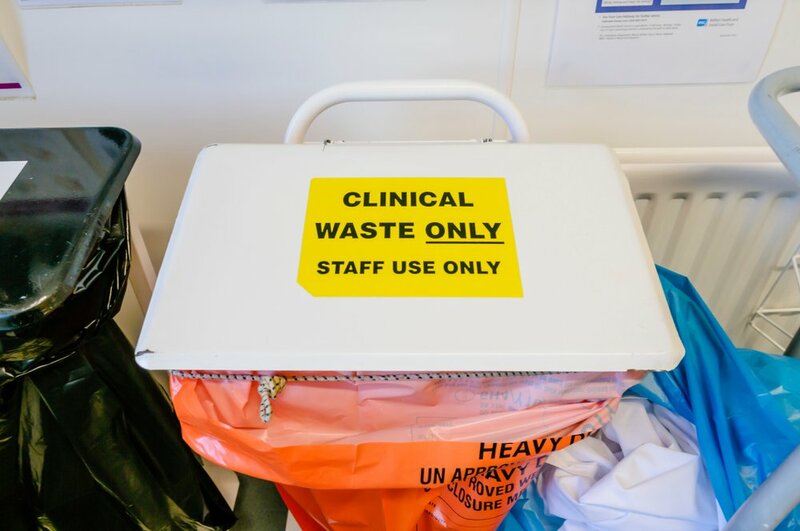 Post detailed reminders in patient care/waste disposal areas – In addition to compliance training and regular review, posting visual reminders can be very helpful in improving the efficiency of point of use waste collection. A large, clearly worded notice, placed on or near waste containers, listing exactly what types of medical waste belong in those containers, can help head off common disposal mistakes. While there is no perfect system that will eliminate all human error in the medical waste management process, taking these steps can help, minimizing the potential for missteps by your clinical staff. Promoting best practices at the source of medical waste – your clinical staff – helps to create a more efficient waste management process overall. That means you'll reduce the amount of time you spend correcting other people’s mistakes -- and your employer’s risk of facing waste pick-up hassles and costly compliance mistakes.